The vehicles suggest Apple is either copying Google Inc.'s (Nasdaq: GOOG, GOOGL) StreetView feature or developing its own self-driving car technology. Apple has toyed with the notion of jumping into the auto industry for years. During one of the patent fight trials with Samsung, Apple marketing chief Phil Schiller said the company had discussed building a car even before it made the first iPhone. Ideas often gestate for years at the Cupertino, Calif., tech titan. With Apple no doubt looking for new worlds to conquer, the auto industry could well be at or near the top of its list. 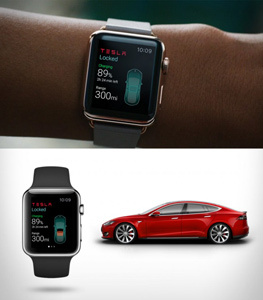 And Apple buying Tesla Motors, Inc. (Nasdaq: TSLA) would make entry into the auto business much easier. Besides, AAPL needs to plan ahead for the day when the iPhone will no longer be the company's primary growth engine. It can do that in two ways. One is to develop new products in new categories in-house, the way it has always done. The other way is to make an acquisition to give it a beachhead in a major new business. And Apple buying Tesla fits the bill. "Apple must increasingly rely on new products to reignite growth beyond the vision" of late founder Steve Jobs, Bill Kreher, an analyst with Edward Jones Investments in St. Louis told the San Francisco Gate last year. "They need the next big thing." Consider this. After its Q1 earnings, the cash pile at Apple is an astonishing $178 billion. That's more than the market caps of Amazon.com (Nasdaq: AMZN) ($173.6 billion), The Walt Disney Co. (NYSE: DIS) ($174.5 billion), and McDonald's Corp. (NYSE: MCD) ($91.8 billion). Yet Apple has made just one large acquisition in its history, its $3 billion deal for Beats Electronics last year. Apple could spend much more if it wants to, and TSLA is affordable. The Palo Alto, Calif.-based maker of electric cars has a valuation of $27.5 billion right now. So with a premium of between 20% and 30%, Apple buying Tesla would cost from $33 billion to $36 billion. That's only about 20% of Apple's cash. Of course the real question isn't whether Apple buying Tesla is doable, but whether the marriage would work. Item (1) is an observation and not a reason. Item (2) would ease a buyout, but that is not a reason to buy another company. That is, should Apple buy every company where the culture is compatible? Item (3) is not a reason for Apple to buy Tesla; it's a reason Tesla would want to be bought. Item (4) Buying Tesla to obtain a visionary is very expensive. Tesla's market cap is roughly $25B, so with a premium, it would be $30B. Wouldn't it be better to just add Musk to the board? Item (5) Apple has already started to integrate with autos. That is true. There are roughly 30 automobile manufacturers looking at CarPlay (ww.apple.com/ios/carplay/). Should Apple buy them all? There is nothing in this article to suggest it would be financially beneficially. There has to be a positive ROI. Assuming roughly $30B to buy Tesla, when would Apple see a financial benefit? How would that benefit materialize? Thanks for reading Money Morning and for an excellent comment. The financial benefit for Apple is in adding an entirely new business that is on the verge of massive growth. The electric car business is one of the few that could move Apple's earnings needle in a big way. Tesla CEO Elon Musk thinks Tesla will be worth as much as Apple is now by 2025. That's rosy thinking, to be sure, but would be a helluva ROI for AAPL if the company bought Tesla now. Hey! Good article. I think it makes a lot of sense for Apple by buy Tesla, they can certainly afford it and the acquisition would give them a great entry into the auto business. We'll see what happens!